The Ottawa Senators and Vancouver Canucks revealed their heritage jerseys on Thursday they will wear for the Heritage Classic on March 2. The Ottawa Senators and Vancouver Canucks have officially unveiled their heritage jerseys to be worn during the 2014 NHL Heritage Classic at B.C. Place in Vancouver. The Sens will take on the Canucks, who visit the Canadian Tire Centre Thursday night, on March 2 at 4 p.m. ET. The game will be aired on CBC’s Hockey Night in Canada. 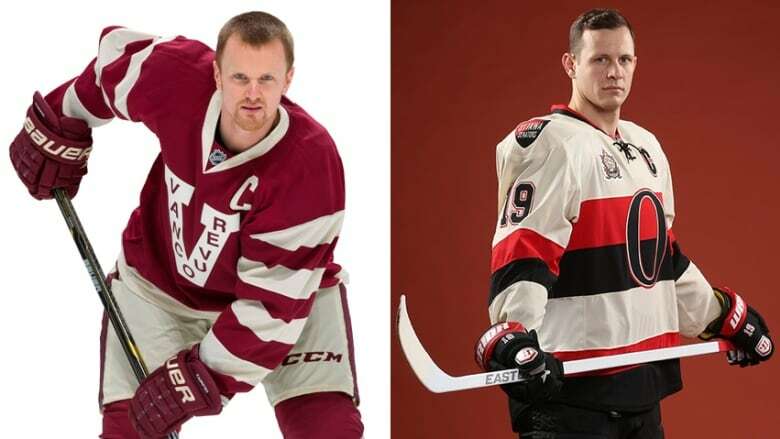 The Senators' off-white heritage jersey is similar to the black one currently worn as the team’s alternate jersey during select home games. The sweaters feature the large "O" logo on the front that stands for Ottawa, reminiscent of the design prior to 1934. The red and black stripes on a cream background are borrowed from the 'barber poles' of past jerseys. The Canucks will wear a burgundy jersey with a large white "V" and Vancouver written inside the V.
The jerseys are now on sale. The Heritage Classic game is a tribute to the 1915 Stanley Cup final where the Vancouver Millionaires faced the Ottawa Senators, which marked the first time champions from the two professional hockey leagues would face off for the Stanley Cup. B.C. Place, which can hold up to 50,000 fans, will host the largest hockey game in the history of British Columbia. It will also mark the first NHL game to be held in a retractable-roof facility.